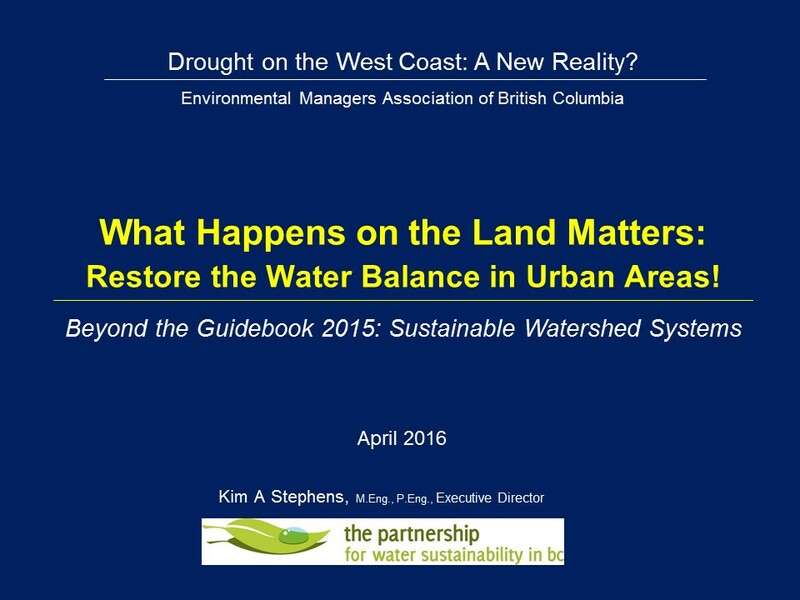 In April 2016, the Environmental Managers Association of BC hosted a session about the 2015 Drought. This provided the Partnership for Water Sustainability in BC with an opportunity to continue the rollout of Beyond the Guidebook 2015: Moving Towards “Sustainable Watershed Systems, through Asset Management, third in a series of guidance documents released over the past decade. 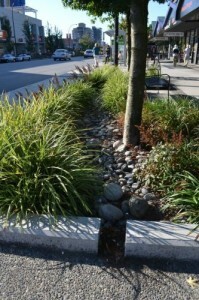 The series builds on Stormwater Planning: A Guidebook for British Columbia, released in 2002. Western North America may be crossing an invisible threshold into a different hydro-meteorological regime. Communities can no longer count on a predictable snowpack and reliable precipitation to maintain a healthy water balance in their watersheds. It has been difficult even for experts to grasp the extent of what the loss of relative hydrological stability means. Last year, in an online poll conducted by CBC News, the public chose the drought as British Columbia’s “Top Story of 2015”. “Three speakers presented on different aspects of water scarcity and connected the dots to the Water Sustainability Act. Oliver Brandes described his vision of what a world-class regulatory system can look like in B.C. Steve Conrad elaborated on climate change science. Kim Stephens explained what needs to be done to restore the water balance in urban areas,” stated Stephanie Voysey, EMA Vice-President (Education). Restore the Water Balance in Urban Areas! The talk by Kim Stephens was titled, “What Happens on the Land Matters: Restore the Water Balance in Urban Areas!”. An engineer-planner, he has more than four decades of experience. This covers the continuum of water resource and infrastructure engineering issues. Kim Stephens has played a leadership role in a series of initiatives in British Columbia related to water conservation and sustainability, watershed health, rainwater management and green infrastructure. In 2003, he was asked by the provincial government to develop the Water Sustainability Action Plan for British Columbia, released in 2004. Ever since, Kim has been responsible for Action Plan program delivery and evolution. Read British Columbia’s new Water Sustainability Act is already influencing Water Management. This article is posted on the Water-Centric Planning community-of-interest on the waterbucket.ca website. Download What Happens on the Land Matters: Restore the Water Balance in Urban Areas!. This is a PDF copy of the PowerPoint presentation by Kim Stephens. “My presentation introduced EMA members to the Water Sustainability Action Plan, the Georgia Basin Inter-Regional Educational Initiative (known by the acronym IREI), and Beyond the Guidebook 2015. It was a great opportunity to inform a new audience and connect the dots in a way that I hope will stick,” reports Kim Stephens. For British Columbians, 2015 was the year of the great drought, dwindling snow packs, melting glaciers, beleaguered salmon runs and a costly forest fire season, followed by windstorms and heavy rains. Launched from a powerful El Nino, storms caused the single largest electrical outage in the province’s history. 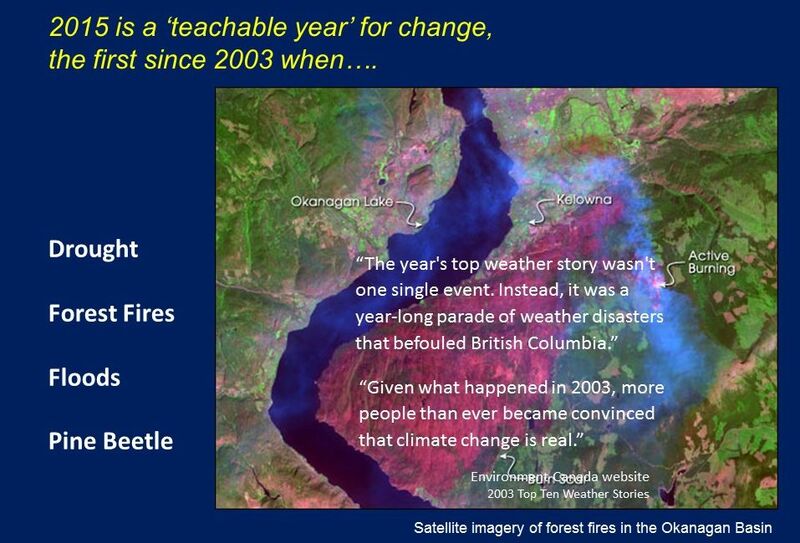 “2015 ranks with 2003 as a defining teachable year. 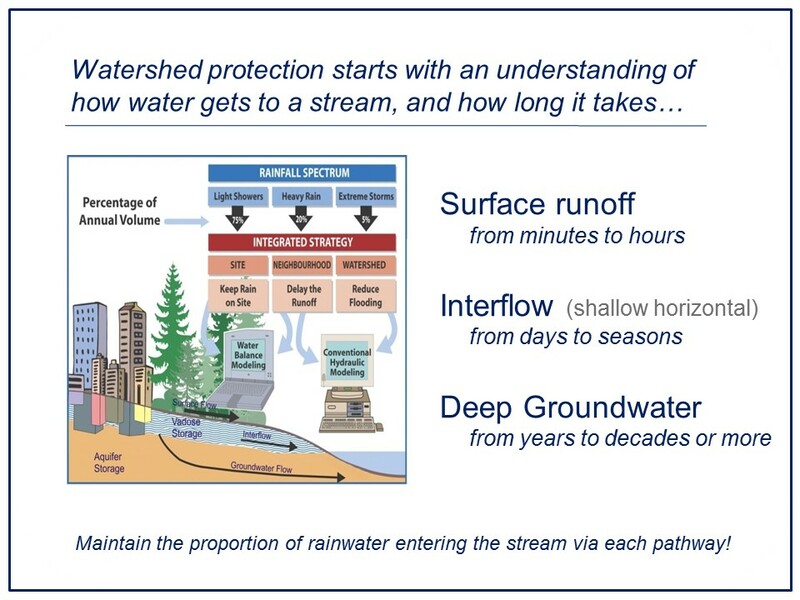 Lessons learned will inform how local governments move forward with a ‘water balance’ approach to rainwater management, protection of watershed function and land servicing,” observes Kim Stephens. “Communities in southwest BC dodged a bullet in 2015. The clock is ticking. 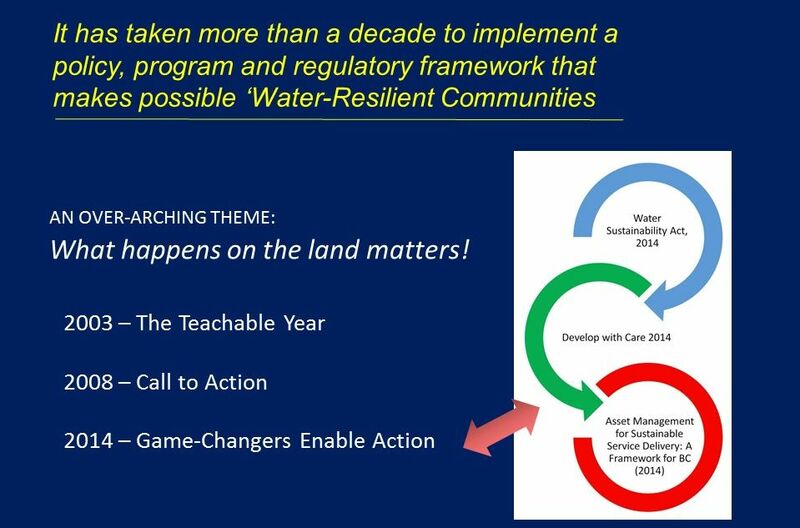 Communities need to leverage this teachable year and seize opportunities to change how the water resource is viewed and managed. This starts with an understanding of the relationship between land and water,” emphasizes Kim Stephens. ”Too often people think of land and water as being independent – almost like silos. But what we do on the land, and whether we treat the land with respect, has direct implications and consequences for water use. 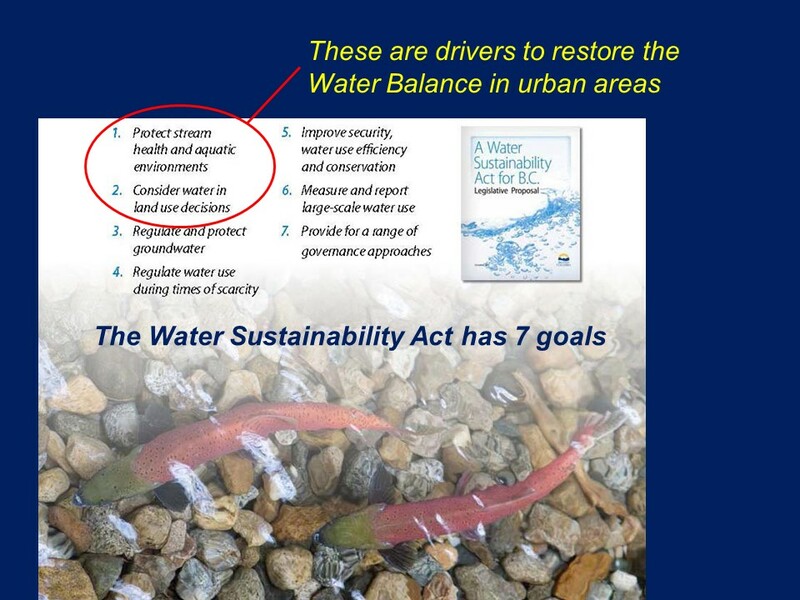 The Water Sustainability Act connects these dots,” concludes Kim Stephens. The 2015 Drought was selected as the Top Story of 2015 in a poll conducted by the CBC. Year-end newspaper, radio and television interviews about BC’s changing climate featured the perspective provided by the Partnership for Water Sustainability in British Columbia. Read “The Drought” was British Columbia’s Top News Story of 2015, a comprehensive story about those interviews. Read Towards Watershed Sustainability: Three landmark game-changers adopted by Province in 2014 enable watershed-based action in BC (Beyond the Guidebook 2015), which is extracted from Part B of Beyond the Guidebook 2015.